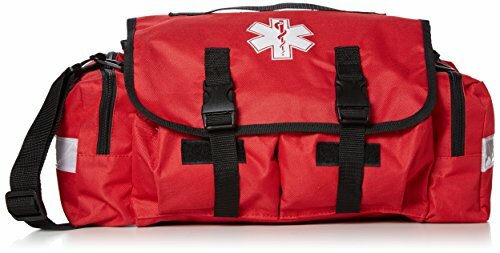 This Dixie first responder kit keeps you ready and supplied for trauma and medical emergencies with the equipment stored in a convenient first response bag. 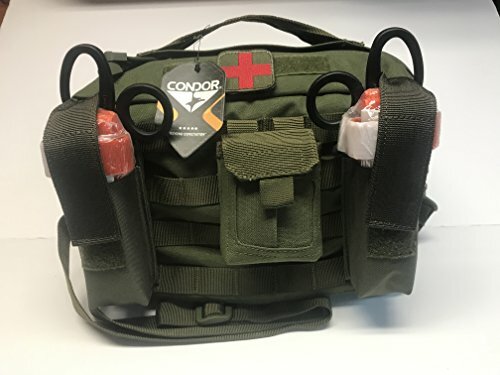 The medical bag has one main inner compartment with 2 built-in pockets along the length, as well as 2 outer pockets and a zippered compartment in the top cover. 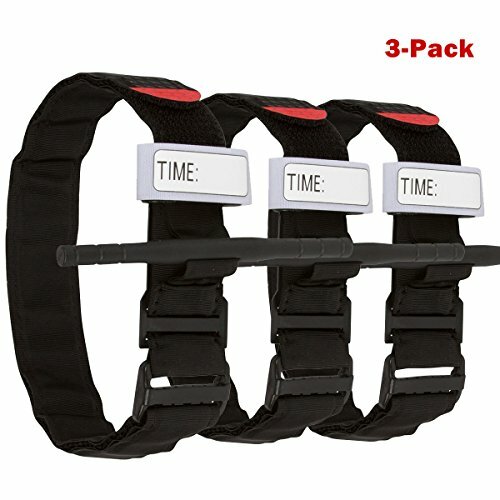 The trauma kit bag is easy to carry with its adjustable shoulder strap and reinforced plastic carry handle. 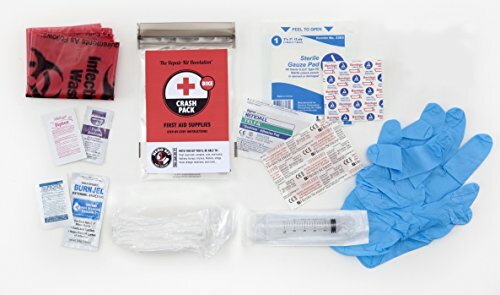 Included items: 1 51/2 inch bandage scissors 1 diagnostic penlight 1 Kelly 51/2 inch straight forceps 1 car face shield with 2 gloves (medium, latex) 1 emergency airway kit (set of 6: 40-110mm) 1 rescue blanket 1 instant cold pack 1 2 inch x 2 inch koolaburn burn dressing 1 4 inch x 4 inch koolaburn burn dressing 1 glucose gel tube 1 wire splint 1 tourniquet 1 seat belt cutter 16 4 inch x 4 inch sterile gauze pads 10 1 x 3 inch sheer bandages 10 3/4 x 3 inch sheer bandages 10 2 x 4 1/2 inch bandages 10 fingertip bandages 10 knuckle bandages 2 2 inch stretch gauze roll 2 3 inch stretch gauze roll 2 6 inch stretch gauze roll 6 5 inch x 9 inch surgical dressings/ abdominal pads 1 multi-trauma dressing 10 alcohol prep pads 10 pap prep pads 4 oval eye pads 2 1 inch cloth tape 4 triangular bandages with pins 20 ammonia inhalants 4 sting pads. Active shooter trauma events to vehicle crashes, public transportation, accidental injuries from natural disasters like tornadoes or inflicted injuries from intentional acts of violence like shootings and bombings, uncontrolled bleeding can result in death within minutes - even before emergency medical services or other emergency responders can arrive. These first minutes following a traumatic injury are crucial in saving a life. 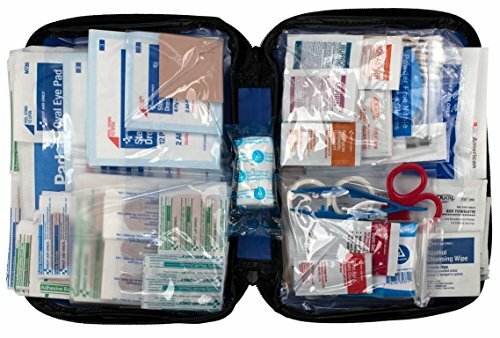 Our kit is designed to deliver the most critical "point of wound" supplies to first responders prior to arrival of EMS. Kit contains: (1) Condor Heavy Duty Utility Bag w/ Molle and shoulder strap, (2) External Molle High Visibility Tourniquets & Pouch's for Fast Deployment, (1) External Molle Glove Pouch w/ gloves, (4) High Visibility Rescue Orange CAT GEN 7 Tourniquets, (4) NAR Hyfin Chest Seals, (2) 7.5" EMT Shears, (4) Celox X Hemostatic Gauze, (4) NAR Nitrile Black Glove - Large, (1) NAR Quick Litter, (1) Roll Surgical Tape, (4) S-Rolled Compressed Gauze 4'x4' (4) NAR 6" ETD Bandages. Available color; OD, 8"H x 12"W x 4.5"D, 5 lbs....All products are factory sealed Berry Amended and dated for freshness...Are You Prepared? 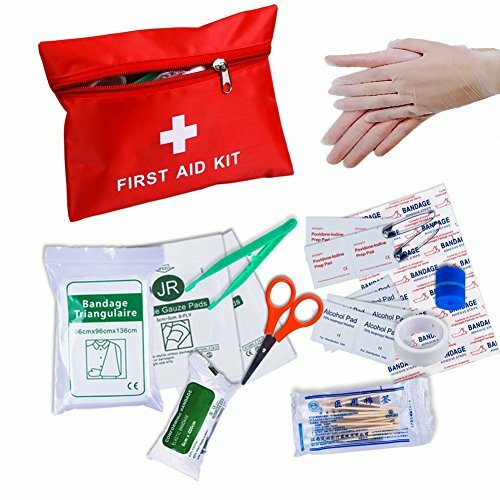 Designed for the unique needs of cyclists This ultra-lightweight first aid kit will help you save the day. At only 3.3 ounces and under an inch thick, it's small enough to fit in a jersey pocket, yet loaded with vital materials and detailed instructions for addressing the most common injuries and incidents on your ride. We hate to say it, but there are only two types of cyclists: those that have crashed and those that will. Road Rash? 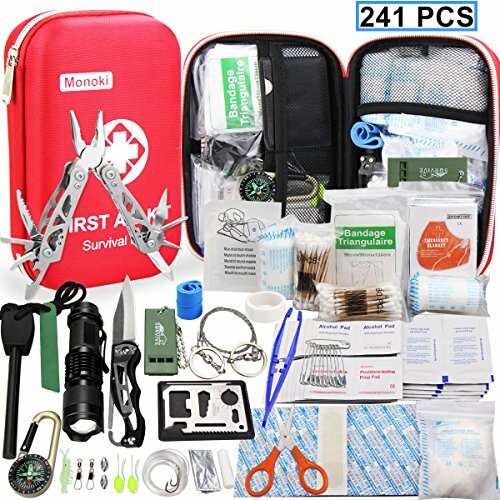 This kit does it better than any other first aid kit on the market. No other kit at this weight and price comes with an irrigation syringe so that you can get all the foreign matter out of the abrasion, Lidocaine antiseptic gel, to get the "ouch out" and help prevent infection, and a WoundStop wound dressing, an innovative gauze and compression bandage, originally designed for military use, that allows for one-handed self bandaging. Kit Contains: LokSak waterproof bag Instruction manual Triple Antibiotic Ointment Lidocaine (2%) Burn Jel 2 Adhesive Bandages 2 Diphenhydramine Tablets (similar to Benadryl) 2 Ibuprofen Tablets 3 Butterfly Closures; 3x3 gauze pad; 3x2 "telfa" adhesive bandage WoundStop wound dressing 10cc Irrigation syringe Exam gloves and bio-hazard bag Be the hero of your ride! 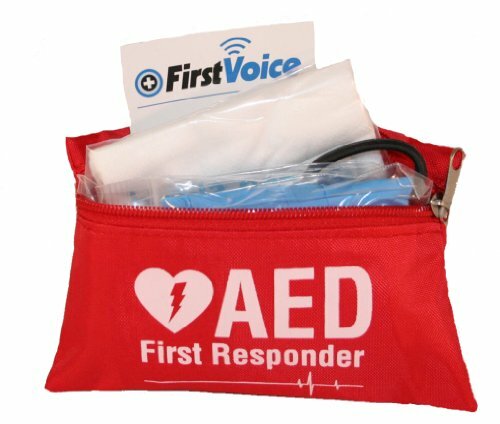 AED fast response kit aids in the quick response to sudden cardiac arrest situations. 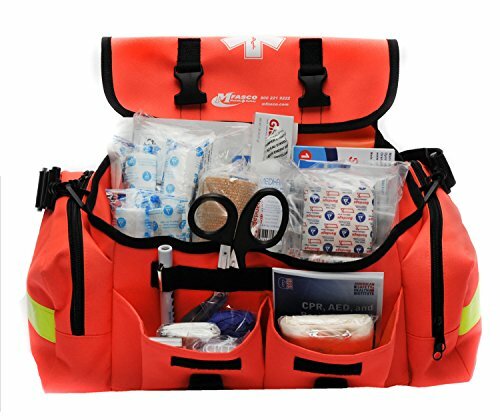 It comes in a durable red nylon bag and includes: 1 razor, 1 EMT scissors, 10 Gauze Pads, 1 CPR mask, 2 Pair gloves, and 2 cleansing wipes. 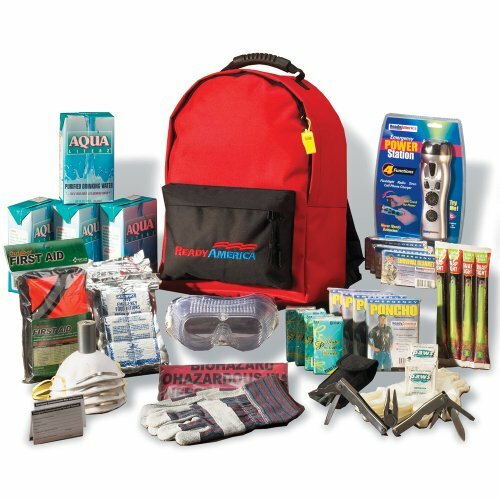 Active Shooter Response Kit Updated!